Ok, it is 9:36 and I still have time to link up with Coast to Coast Kinder for Wednesday Wow Science and Social Studies Edition. I may or may not have put my toddler in front of Dora in order to get this done..as well as when I have to get other things done. Let's just say she's memorized the dialogue to one episode. 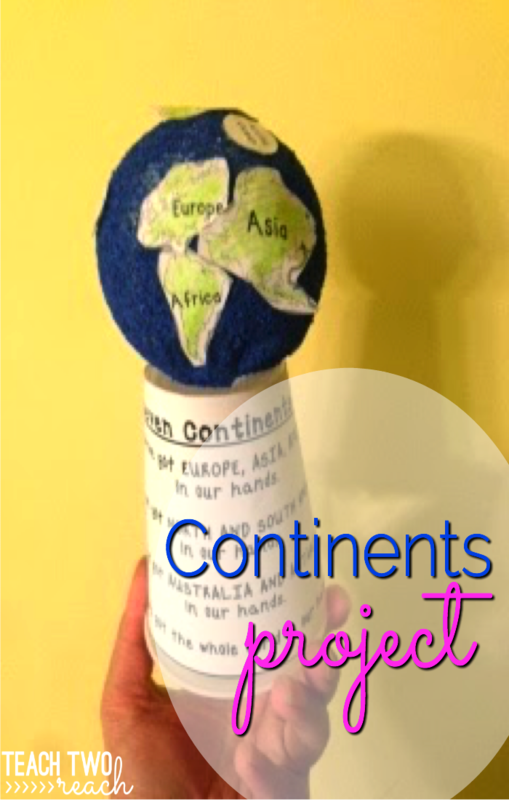 And so have I.
I'm going to share a project I have done in the past to have students learn the continents, oceans, and their places on a globe. We spend a lot of time just memorizing the names of the continents and oceans and what the continents look like. They know which continents are next to which, etc. But I wanted to have them learn the placements relative to a round object rather than a flat map. So, the pictures I am going to share are of the project I plan to do next week, but have done a few times in the years past. So here's how we start. The first step is learning and practicing where the continents and oceans go in other lessons. We learn the 7 continents from the song that has the tune of "I've got the whole world in my hands." I only teach Atlantic, Pacific, Indian, and Arctic oceans. My S.S. series doesn't include Southern, so I leave it out too. Once you think the kids have a good handle on it, for assessment, this is a perfect project. I also got some blue acrylic paint - the small bottle is 99 cents and a couple should do for a class. Also, get those cheap foam brushes because they are much faster than the regular paint brushes. So anyway, on day 1, have students paint the globe blue with the foam brush. It can get messy because they have to turn the globe around in their hands, so you can choose for them to wear gloves. But the paint is pretty easy to come off. Let the globes dry overnight. The next day when the globes are dried, give students a printout of the continents and the oceans. Have students color all the continents green and leave the ocean circles white. Then they have to cut them out and glue them on the Styrofoam globe in the places they should go. Now, I would say use Tacky Glue, because it holds the best on the Styrofoam with minimum falling off. You can try to use regular Elmer's Glue, but students may have trouble with it staying. But you can try a sample first and see if it works! Ok the next part I realized I forgot to do in my sample of taking pics, but I am going to have students do this. I will give them a piece of red yarn or a pipe cleaner, or even a strip of red thin paper, to glue around the globe to represent the equator. After the globe is completed, the optional parts come next. If you have ceilings you can hang things from, a great idea is to put an open paper clip in one end of the Styrofoam, attach a long string, and attach the other end of the string to another open paperclip or something that can hang from the ceiling. Or you can do what I've done here. Take a popsicle stick and a foam or plastic cup. Stick the stick inside the ball. Push it through a cup's bottom (you'll have to cut the opening), and then pull down the ball onto the cup so it rests on top. You MAY have to cut off some of the stick so that it can be even with the bottom of the cup and the cup will be stable. 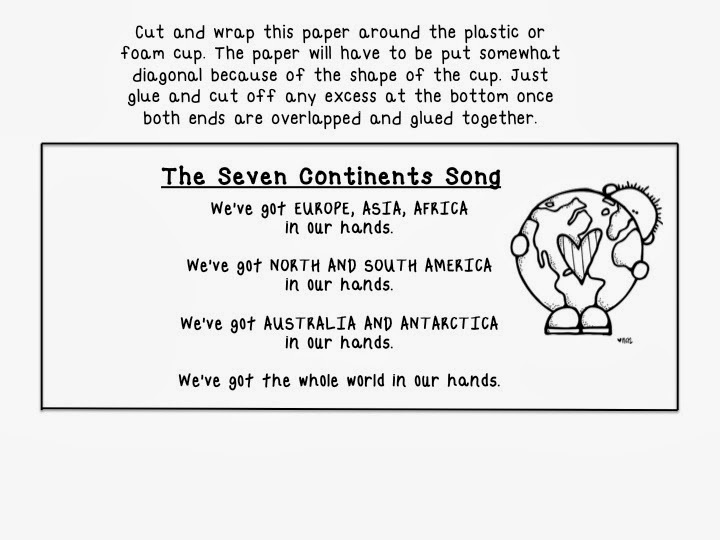 Finally, wrap the continent song paper strip around the cup, so the kids have an easy visual and the song to remember the continents! Just for my wonderful blog readers, I am giving you guys this small file for the continent/ocean pieces, and the song to wrap around the cup if you go that route. 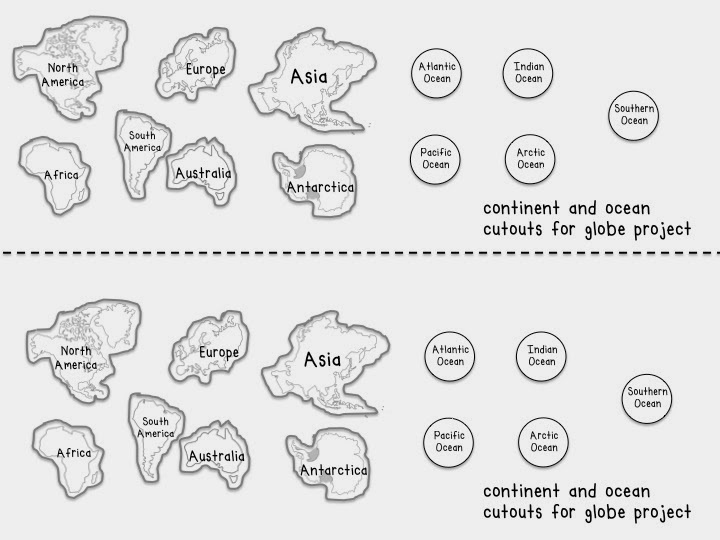 I outlined the continents so it is easier for students to cut. 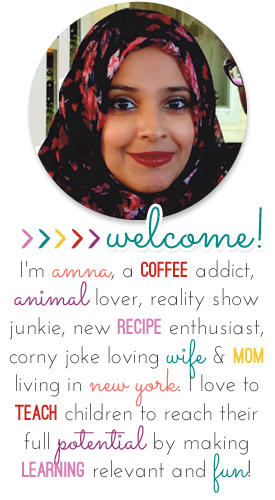 Please click HERE to get the file! thank you for your comment! I hope you can do it with your students. This is so cute!! What a great model for the kids to get to have! Love it! Thank you Kelly! I have such a large class this year compared to other years, so I hope it goes well next week when I do it again. This is a great idea. I will have to explore it further when we continue with our Social Studies. Thanks Charlene! Hope you can use it! What size styrofoam balls do you use for this project?